Hunt the Signal was a competition part of the Hunt the Truth alternate-reality campaign for Halo 5: Guardians. Teams of four competed in order to have four characters in Halo: The Fall of Reach - The Animated Series be created in their likeness. On Monday, April 27, 2015 a YouTube account by the name of Shar Eldy, an anagram of Dr. Halsey, posted a Ford advertisement with several Hunt the Truth frames edited in. This advertisement was also played in movie theaters for the release of the 2015 superhero film Avengers: Age of Ultron. On Friday, May 1, 2015 XboxUK's YouTube account posted a video containing three hidden frames related to Hunt the Truth. In addition there is a "glitch" in the video that translates the binary into www.hunthesignal.com. When viewed on a mobile phone the website showed a countdown ending on Monday, May 5 2015 at 3:00AM PST. Once the countdown was finished several coordinates for the contest were revealed officially starting the contest. The end of the 6th episode of Hunt the Truth contained a hidden message saying stolengauntlet.com. This website redirects to the Ford YouTube advertisement. 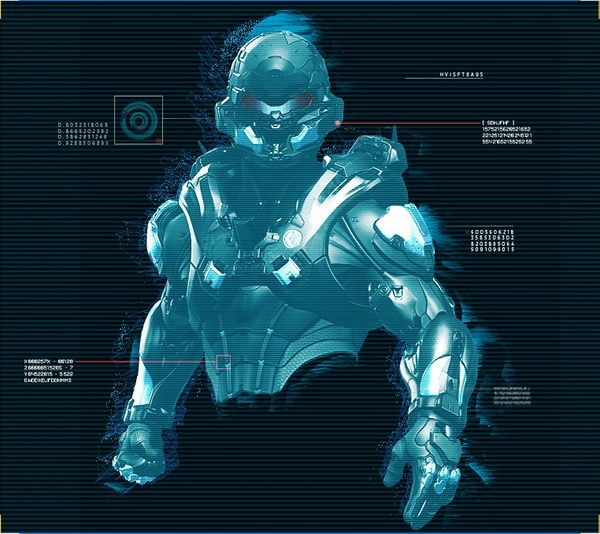 From a canonical perspective the teams were a "non-volitional" AI tasked by Jameson Locke to find weaknesses in the Spartan-IIs and the MJOLNIR Mark VI armor. Though the competition officially ended on Friday, May 22, 2015, the team Section 3 had already won by Saturday, May 16, 2015. Section 3 consisted of SepheusIX, Devoltar, MrToasty XD, and stckrboy. My name is Jameson Locke. You are a non-volitional AI created for the purpose of determining vulnerabilities of Mjolnir combat armor per STOLEN GAUNTLET—a red alert failsafe in the event that any Sierra asset were to operate subversively outside mission parameters and operations protocol. Complete your tasks discreetly. You are located within a secure naval intelligence facility. Locke has tasked you with evaluating potential vulnerabilities of Mjolnir combat armor, exploring the hypothetical scenario of having to neutralize a Spartan-II asset. This includes initiating the armor, manipulating the 49 pieces of its circuitry, then ascertaining its weakness by calibrating the Mark VI firmware. No team has found all the circuit pieces yet. Be the first. You cannot complete this mission alone. Recruit a full team to join the hunt. Now you have the circuit, the key to moving forward is unscrambling letters. Assembled the circuit letters? Kolo fro Shaley to continue the hunt. Halsey: Find me in the forum. I am a little mixed up. A fusion of the energy sword and a Carbine - perfect for long distance and close-range fights. Double Shot Gun could be cool too, one in each hand! A bit of spray and pray never hurt anyone. Has a new countdown appeared? All this hype is killing me. I wonder what else will be uncovered. Keep hunting. Some have found the right stops. Good work. Your diagnostic test to find the vulnerability could be instrumental in the apprehension of a potentially rogue Spartan asset. Locke has now tasked you with with the infiltration of a highly secure archive created by Dr. Catherine Halsey, director of the original SPARTAN-II program. Insight into the physiology of S-II assets might shed light into additional vulnerabilities which could be exploited in the case of STOLEN GAUNTLET. Caution should be taken, however, as this archive may be heavily guarded by an extant program in the previously quarantined facilities. Jerrod: Win this game in 3 moves. Jerrod: These files are protected by me. And you are but a small spark against my brilliant intellect. You have 3 moves. Jerrod: You may have won this game, but you have not won. This is just the first of my incomparable security constructs. Jerrod: I can spin through a hundred-thousand cycles in the time it takes you to rename an access drive. You've got no chance against me. Jerrod: I've made 'impenetrable' firewalls crumble in but moments, I can do the same to your efforts. Jerrod: You are but a fragment of my abilities. Jerrod: You are a splinter, a nuisance... nothing more. Jerrod: You can probe all you want, like a mouse against castle gates. You will accomplish nothing. Jerrod: You think you can get past me? I didn't know rampancy was possible for such a simple construct. Jerrod: I have built worlds in my mind. You can barely assemble words. Jerrod: Your cyber-intrusion technique is pitiable. Jerrod: I can unravel the puzzles of the ancient and the lost. You lost before you even began. Jerrod: You will forever remain in my shadow. Jerrod: Are you still working on my simple puzzle? I barely noticed. While hacking Halsey's directories, you gain access to the last-viewed satellite image of an unknown off-world colony before signals from it were lost. You've reached the end, but it's just the beginning. The mysterious Forerunner signal was originating from a remote location. The source: this alone symbol, was from violent seismic activity on a remote human colony. You've hunted the signal's source, so the ONI can now investigate. Your endeavour has brought us one step closer to the truth. As one of the earliest teams to locate the signal you could be eligible for a reward. If your team is selected, we'll contact you agains shortly. Thank you for being part of Halo: Hunt the Signal. In this campaign many users found content that was not meant to be found, some of which suggesting this was originally a Halo: Reach marketing campaign. Before the campaign started, many links were found relating to later parts of the campaign. This led to a reorganisation of the campaign leading to Transmission 3 being cut with all relevant puzzles, leaving only remnants. During your analysis of the STOLEN GAUNTLET protocol, a sudden burst of energy and data emanates from a nearby ONI relay. You are captivated by the specifics of the data due to its symmetry with discreet information acquired from Halsey's archive. It appears to be Forerunner in origin. Using all available means, you pursue its source. You are an AI situated at a classified location on Reach. and then calibrating the armor. But first, the Mjolnir armor has to be activated. You are an AI situated at a classified location on Reach.ing order and then calibrating the armor. But first, the Mjolnir armor has to be activated. If a team used Transmission 3 and everyone followed the link. Every member of the team got taken to a different Audio clip. Once sorted it sounded like this. "This.. this is.. *garbled* I repeat, we *garbled* we need assistance, our coordinates are noor-- *garbled*"
NOBLE Team as Chess pieces. Original Ring Puzzle Error Message. Error Message relating to an unused page. Original path that had all this content in it. The image of Catherine Halsey included as part of Hunt the Signal is the same image that can be seen on Halsey's ONI security badge included with Dr. Halsey's personal journal when viewed under a black light. The hidden message in Hunt the Truth Season 1 Episode 6 that led to the video with the images. The first image hidden in the video related to Hunt the Signal. The second image hidden in the video. The third image hidden in the video. The entrance code for entering the competition. The coordinates for the first task. The first puzzle of the MJOLNIR Mark VI circuitry is completed. Jerrod's Chess game with the ONI AI. The Rebus you got after you completed the Chess game. Half-way though the Ring Puzzle. Image with the security code on it. More DNA from Halsey's archive. A file with Dr.Albans name on it. A scan of someone's brain with Alban's name on it. Someone's spinal cord with Alban's name. More scans with Alban's name on it. Access to satellite view obtained from DNA archive. Satellite view of an unknown colony. Image to co-ordinates to in Starcope obtained from the LAB archive. The message to the victors. The email to the winning team, Section 3.